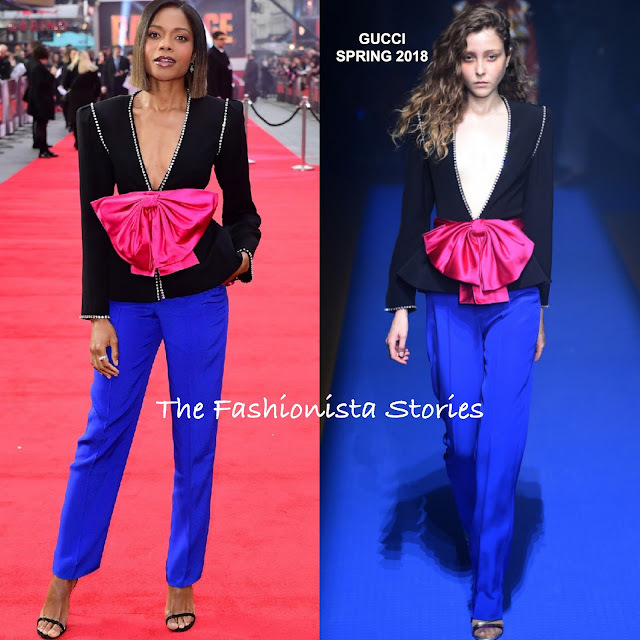 Continuing on the promo tour, Naomie Harris made her way to the red carpet this evening(April 11th) in London for the 'Rampage' premiere at Cineworld Leicester Square. The actress worked a chic, sophisticated look courtesy of GUCCI. Her SPRING 2018 ensemble which featured a long sleeve black v-neck peplum top with sparkly beading trimming & a over-sized fuchsia bow waist sash and cobalt blue trousers. Although I wish the pants were a bit more tapered, this is still a winning look for me. The color combination comes together perfectly and makes this ensemble effortlessly noticeable. Also Naomie had the v-neckline shorten which worked in her favor. She finished up with a flawless beauty look and black JIMMY CHOO ankle strap sandals. Are you sold on Naomie's look as well?